Its been really a while since i was trying to make a template. I am really happy to release my first Blogger template. I have tried to make this template as simple as possible to use. This template is based on the current design of my blog and extensively uses CSS3 and jQuery. Its rich in features and easy to use. After many days of working on this template I am finally happy to present this new blogger template “STYLIFY”. 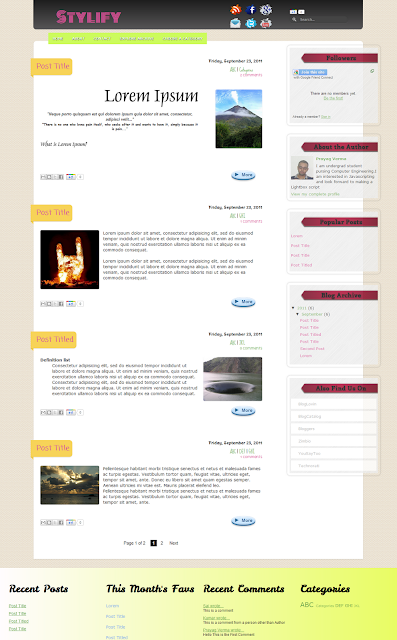 Its my first template and its a simple blogger template with extensive use of CSS3 and jQuery. 2. In your Blog, Go to Design > Edit HTML and Then Click on Choose File and after selecting the Downloaded File ,Click on Open . After that Click on Upload. 3. During this process a Dialog-Box will appear asking Whether you want to Delete or Keep Your Widgets. Its up to you to decide. After this the template is installed. This templates has lot of customizations possibility. Its Features can be configured as per your Needs. In here I would be explaining how to modify features of this template according to your nrequirement. I would also be explaining some hidden features of this template. There is a Green Navigation bar present in this theme. To modify this Go to Design > Edit HTML. Tick the "Expand Widget Template" option. Now Search for ( Using CTRL+F ) the term navmenu. After that you can change the URLS and Names according to your Needs. You can change the number values as you like in the above code. var postperpage=9; → Changes the no of posts that will show up on clicking any page number. Note: Make sure that you also set the value of Number of Posts on Main Page (Go to Design > Page Elements , Click on Edit option of Blog Post and then Number of posts on main page: ) to same as that of the postperpage value. If you want you can delete it ,but if you want to use this selectively then I suggest add a .image attribute before img like this. You can see the demo of Link Nudging in the Demo Blog's Sidebar. To change the buttons just get code from the ShareThis website and place it in the above code. There are two more sets of Share Buttons present in the Blog, one above the Post and the Other Below the Post. If you find any problem with the template please do tell us by leaving a comment below. I love the Post Title design, sidebar widget designs and the comment form design. What i don't like is the width of the post body. I think it should be shrink to at least 800px width. This is a good template. And his right. The body post width is too wide. May be you could use this for lengthy post. Well, with the problems on the post width, you can modify the codes on Blogger. Go to edit HTML> find the post width code and change the number to 800. That was simple. But be sure to backup your template in case of errors. @Prayag Verma - How did you put the social media buttons on the left sidebar? I want to learn that too. Mind if you share. Thanks!I'm also using Blogspot blogs on my other blogs. @Allen | Kankakee Injury Lawyer - just make a Google search with these keywords " Adding floating social media buttons on blogger"
Then just follow the steps. Installing the widget is easy. Well done, Bro.. and this blog's new template too.. love it! Great work, keep up your good work! Thank you for such a wonderful template. I uploaded it in my blog. But I need your help in fixing some issues. 1) The tags shown in each post are not aligned in a line. It is over writing the blog post itself. If you see my blog, you will know what I mean. Can you please tell me how to bring the tags to below the post. 2) I want to change the Blog Title Font to a simpler one. 3) If you notice, the Search column in my blog is jutting out of the main header banner...Probably it is because of the bold font used.. Unfortunately the first solution you provided is not working. When I replace the code with the one given by you, it is removing the blog posts itself. I had to re do the template upload work all over again. I just need the tags/labels shown on each post to be moved to below the posts and not appear on top. And it has to align in one line rather than how it is shown now. Please do check my blog and you will get a better idea. is there a way to change the navigation menu color and style??? To remove the whole footer from the blog remove all the content inbetween footer tag and also to remove the b:sections with id="footer-2-1" till id="footer-2-4"
I like this usefull information, I’ll follow your blog even more when you’ll keep up the good work! Very stylish template PV and nice work for you !! I have a plan to change my template with Stylify begin New Year 2012. But I prefer with your template footer in the footer of this than in Stylify. Lastly if it does not matter if I add the breadcrumbs on Stylify template ? The second problem is I want to enlarge the font size in a box labels how do I do this? This template is awesome!! I really liked it!! I would also like to design such beautiful template!! Would you please write a step by step tutorial on how you designed this template, tools that you used and other things!! I am really looking forward to go into designing but the only thing I need is a little help!! @Ashutosh DaveFirst of all thanks !! Thanks for sharing this great templates. I am recently using this blogger template designed by you in my new blog http://fullsap.blogspot.in/ but in that "more" button is not working. It vanished and full blog post is visible in home page. Let me know what could be the possible reason and how to rectify it. Also i want to know how your Recent post gadget is not present in your home page but when i open and post it appears. You need to add jump break to all your posts!! It looks like your previous template might have had a Auto-Read-More hack in it so you might not manually added it through the Post Editor. I have the same mistake, on my blog disappear all read more, comment, share button after topic. How to fix it? Hi! I installed your template and I have a few questions. My Read More button on the front page got additional letters ( a-c). I know that there is something in the template but I have no idea what and I'm afraid that I would broke down the rest of the page if I temper to much. Thanks a lot, I will certainly chew up the cse link! I change my template again, and I'm installing the effects on the go. Hopefully my blog will get the effects and looks I am hoping for. The templet search box on my blog not working properly. What Should i do??? but i just want to use nudging link feature in my template, so would you please tell me how can i do this...? Could there be any option to expand a template so that it would cover all the screen width?